Looking for a decorating theme that’s out of this world? 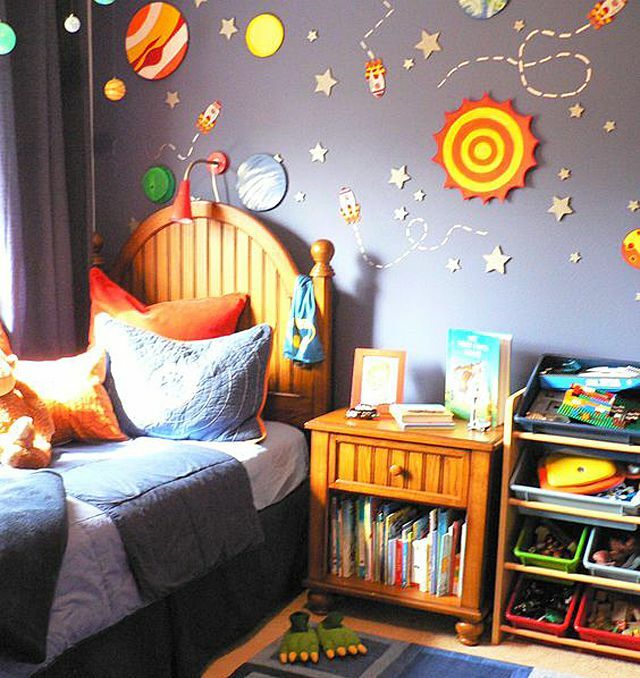 You can’t go wrong with a space-themed nursery or kid’s room. Fun, versatile, and gender-neutral, this much-loved motif ignites the mind and imagination, creating an early fascination with science and technology that could last your little one a lifetime...or at least until they head off to college! Whether you’re inspired by the night sky or intrigued with the worlds that lie beyond our own, these 18 amazing space-themed nurseries and kids’ rooms may be the perfect fit for the junior space explorer at the center of your universe. Rustic wood paneling, bold red accents, and a whimsically retro cartoon-inspired space mural give this beautiful boy’s room, spotted on Home CBH, a distinctively vintage flair, recalling a decade where American space exploration captured the imagination of children and adults alike. With its dramatic and realistic earth mural, this space-themed bedroom photographed by Jill Baker Photography and featured on Houzz brings new meaning to “a room with a view." Bold color, modern furnishings, and industrial accents complete the space, giving it a fun and creative vibe. This bright and modern nursery space featured on Project Nursery couldn’t be more chic! The stunning constellation mural, understated accessories, and arty orbit-inspired light fixture give the room a distinct theme without losing an ounce of sophistication, and the bold black and white rug makes the perfect statement in an otherwise subtle space. Another understated beauty, this simple modern space by Interiors. Family blends brightly hued retro-inspired pieces with clean contemporary décor. A wallpaper mural, blazing with orange and blue accents, shows the space shuttle Endeavour floating over Earth's luminous horizon as photographed by a NASA crewmember on the international space station. Talk about a conversation starter! Can’t afford to buy an elaborate wall mural for your little one’s nursery? Why not create your own? This beautiful constellation-themed accent wall, created by Jen from Jen Loves Kev, came together in one afternoon. All you need is a pencil, a ruler, a silver sharpie paint pen, and a little bit of imagination. This creative yet practical space by Simon Bray Interiors incorporates a work area and plenty of storage into its space adventure theme while transporting its young tenant to the inside of his very own space ship. LED lights installed into the one-of-a-kind headboard give the appearance of twinkling stars and a rocket-ship porthole offers a stunning view of planet earth. 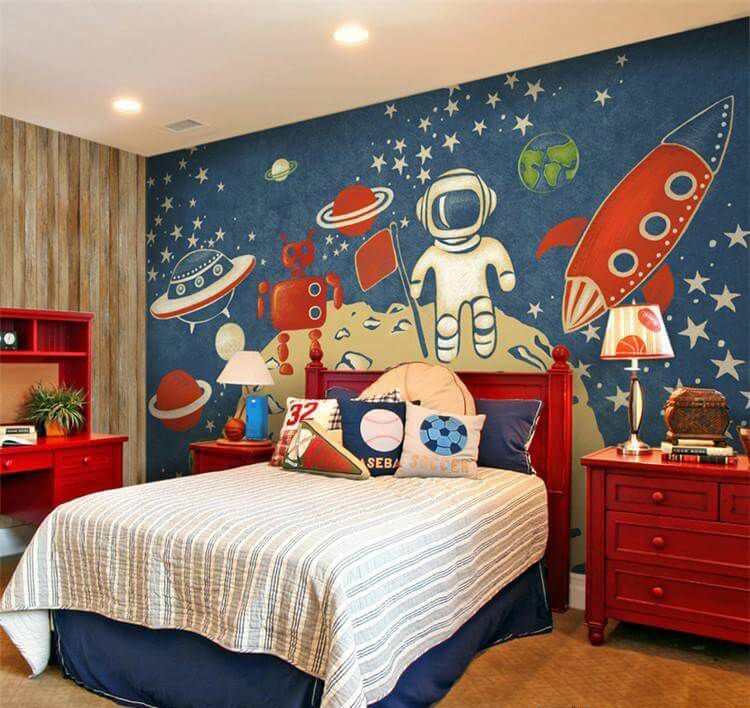 With its elaborately painted ceiling, glow-in the dark stars, and creative 3D space scape featuring planets, moons, asteroids and comets, this bold and colorful bedroom designed by Space Coast Construction and spotted on Houzz is a little kid’s dream! This simple modern play space, spotted on Instagram, allows its tiny occupants to contemplate the wonders of the night sky without missing bedtime. And what child wouldn’t want to build the spaceship of their dreams at their very own robot-themed Lego table? Too cute! This soft and sweet nursery room featured on Style Me Pretty offers an understated star theme with a dusting of glittering gold. Love the one-of-a-kind artwork? Make your own DIY watercolor and gold leaf constellation art with this simple tutorial. Clean, contemporary, and gender neutral, this black, white, and grey nursery room by Kristen Jeffers offers a whimsical view of the moon and stars, hand drawn on a simple chalk paint accent wall. While an elaborate mural can really make a space, they can be difficult and expensive to incorporate into your design. This simple alternative offers all the theme-setting atmosphere of a traditional mural for much less and can be easily updated to reflect your little one’s changing interests. Genius! Metallic gold and silver wall decals transform a rich navy accent wall into an eye-catching abstract art piece in this chic and modern, constellation-themed nursery room by Suzann Kletzien Design. Furry and feathered friends of all shapes and sizes dance across the night sky in this whimsical, constellation-themed bedroom designed by Kasey of The Adventures of Mike, Kasey, Riley, and Scout. Tribal-inspired accents throughout the space point to the connection between Native American culture and the stories of the stars. What better way to fall asleep than under a canopy of shining silver stars? This beautiful gender-neutral nursery space, created by Dina Holland and spotted on her beautiful blog, Honey & Fitz, boasts a simple celestial theme that will last way beyond the baby years. This hand-painted galaxy wall, spotted on Young House Love, features simple sewing-hoop planets for an adorably crafty take on the traditional space mural. This adorable Star Wars-themed boy’s room, designed by Samantha of Little Bits of Home, transports all who enter to a galaxy far, far away while maintaining a fresh contemporary appeal that can be easily updated as her little man grows. Featured on Brooklyn Limestone, this urban nursery room packs an entire galaxy’s worth of style into an extremely tight space. While dark colors are normally considered a no-no in small rooms, the contrast between the rich navy constellation wall and the rest of this all-white space actually creates an illusion of openness, making the room feel worlds bigger than it actually is. With its rich navy walls, space-themed accessories, and ceiling full of twinkling stars, this celestial-themed bedroom by Etch Design Lab is the perfect place for your little astronomer-in-training to lay back and enjoy an out-of-this-world view. The lucky inhabitant of this space-themed, charmingly industrial bedroom featured on Home Designing spends his nights awash in the realistic glow of a dramatic silvery moon. A telescope and a chalkboard wall full of scribbled diagrams and formulas complete the space, making it look as though it belongs to an astronomer hard at work.